VIENNA, Austria -- Visiting Ukrainian Prime Minister Mykola Azarov sought the Austrian government's help on Monday to block the planned South Stream gas pipeline project led by Russia, which was designed to bypass Ukraine. 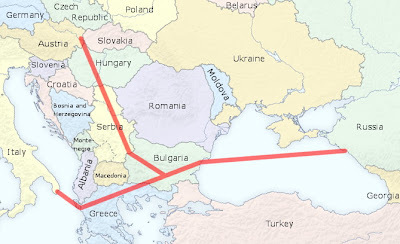 Proposed South Stream gas pipeline. Azarov, who was on a working visit to Austria, made the suggestion while meeting with his Austrian counterpart, Werner Faymann. The Austrian government did not provide the details of the talks, but some media reports quoted Azarov's comments that the project would have a negative impact on his country, and he hoped Austria would address the Ukrainian concern on the issue and help to persuade Russia and the EU to give up the project. He also urged relevant countries to make maximum use of Ukrainian pipeline systems by increasing investments in upgrading projects. Announced in 2007, the South Stream gas pipeline is a joint project of Russian energy giant Gazprom and Italy's Eni that envisions exports of Russian gas to Western Europe through the Black Sea. The gas pipeline's annual throughput was estimated at around 63 billion cubic meters. While visiting Brussels last month, Azarov also spoke against the project, insisting Ukraine was a reliable transit country for Russian gas to be transported to "whatever direction" that the Russian side wishes. Disputes over gas price have strained Russia-Ukraine relations in past years and affected supplies to European customers as Ukraine hosts a major transit route for Russian gas supplied to Europe. The Russian government has accused Ukraine of repeated diversion of gas bound for Europe without making due payment. Despite improvement in Russia-Ukraine relations in recent months, disputed issues have remained, including those on the formula for determining the price of the Russian gas.